Senior and Disability Action will be hosting three town hall meetings for seniors and people with disabilities to voice concerns about pedestrian safety in their neighborhood and educate our city officials on how to make the city’s streets safe for all of us! For more information and to request translation, please contact Senior & Disability Action at (415) 546-1333. Please refrain from wearing any scented products, including perfume, scented lotions, detergents, hairsprays, etc, to keep the space accessible to all people with disabilities. SDA has issued a position on the new Bike Yield “Idaho Stop” Legislation, proposed in the San Francisco Board of Supervisors. Please click here to read SDA’s position statement. SFMTA has proposed changing the route for Bus #33, so that riders trying to get to San Francisco General Hospital would have to get off the 33 and transfer to another bus. Local community members and SDA are working to stop this change, because of the negative impact it will have on seniors, people with disabilities and other underserved populations. Take a look at a video we put together about this issue. 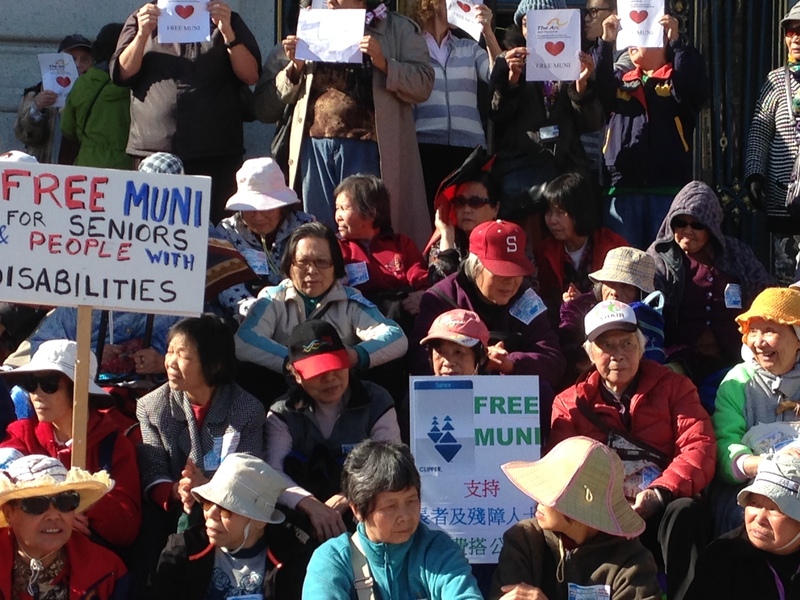 SDA is proud to have participated in the successful campaign to win FREE MUNI for seniors and people with disabilities in San Francisco. The program was launched on March 1, 2015. F R E E M U N I V I C T O R Y ! After a year of advocacy from SDA members and collaboration with Chinatown CDC and many other community groups, we won Free Muni for low and moderate-income seniors and people with disabilities! The San Francisco MTA voted unanimously on Tuesday, January 20 to approve the program. or in the SDA office. Now that we’ve got free Muni, do we need fare enforcement? We are conducting a survey on Muni’s fare enforcement because we want to hear what you think. Please click here for the fare Enforcement Survey and send it in to SDA.